Beckwith, Mosser and Owen, New Mormon Challenge: Responding to the Latest Defenses of a Fast-Growing Movement, Zondervan, 2002, 535 pages. In a recent email a Mormon friend asked about material from Ancient Near Eastern studies that Mormon apologists were using to support the Book of Mormon. He noted Mormon scholars today refer to linguistic and geographic parallels they claim support the historicity of the Book of Mormon, but he felt inadequate to evaluate the proposed “evidence.” Concerned about the technical nature of these arguments, and wanting to see more than just a pro-Mormon perspective, he asked if I had come across anything outside the Mormon camp that addressed and evaluated these theories. I was delighted to be able to refer him to the book New Mormon Challenge. "I received your suggested book, "The New Mormon Challenge" It appears to be very well written. I am diving in head first. I appreciate the non-confrontational, and respectful approach of the book. I never appreciated being told by non-Mormons what it was that I believed." God is one among many gods who simply organized existing matter into the world we know rather than creating all there is from nothing by simply the power of his word. Two years ago I would have had a hard time providing competent, scholarly evaluations of many of these claims, but today that is not the case. God – Creator or Master Craftsman? New Mormon Challenge addresses the Mormon worldview as it relates to the nature of God and creation. Are there good reasons to believe in creation ex nihilo (out of nothing), or did God use existing matter and organize it as the Mormon Church teaches? Dr. Paul Copan and Dr. William Lane Craig, team up to present the biblical, theological, philosophical and scientific reasons for the doctrine of creation ex-nihilo, and at the same time expose the flaws inherent in the teachings of Joseph Smith and other LDS prophets and apostles. Their chapter includes an encouragement to LDS theologians and leaders to reconsider their position in light of the Mormon scriptures that allow for belief in creation out of nothing. It is interesting to observe that none of the passages we have looked at in the LDS Standard Works explicitly denies that God created the universe ex nihilo. The Book of Abraham creation narrative implies that the earth was created from preexisting materials, but it does not preclude the possibility that God created this matter ex nihilo at some point prior to the earth’s formation. Doctrine and Covenants 93 does say that “intelligence, or the light of truth” was not created or made, that “man was in the beginning with God” and the elements are “eternal.” However, all parties agree that there is some equivocation on the meaning of the word intelligence in the LDS scriptures; so it need not be taken as a reference to the primal part of a human being. In fact, the epexegetical equation of “intelligence” here probably refers to what Doctrine and Covenants 88 calls the “light of Christ,” which is “in all things, which giveth life to all things, which is the law by which all things are governed, even the power of God who sitteth upon his throne” (D&C 88:13). Understood in this way, uncreated intelligence/light of truth can be viewed as part of God’s eternal being (p. 101). I think many Latter-day Saints will find it refreshing that the authors take Mormon scriptures seriously, both as they interpret and interact with them. This includes the section on Book of Mormon studies which examines whether or not the Book of Mormon contains parallels to Ancient Near Eastern documents and linguistic styles – things that Joseph could not have known about apart from divine revelation. LDS researchers and apologists have put forth a steady stream of external and circumstantial evidences they claim support the authenticity of the Book of Mormon (and by extension, Joseph Smith’s prophetic calling). And while there is no reason to question the intelligence or academic credentials of these men and other Mormon apologists, when have you seen a non-Mormon peer review of their arguments for Mormon topics? The average person is hard-pressed to evaluate such material, but Thomas J. Finley, a specialist in Semitics and Western Akkadian, provides just such a peer review. In his chapter titled “Does the Book of Mormon Reflect a Near Eastern Background?” he evaluates the claims made by LDS scholars like Hugh Nibley, John Tvedtnes, John Gee, and Royal Skousen among others, to have found ancient linguistic and cultural parallels that support the Book of Mormon. Finley systematically examines these parallels, providing more plausible and logical explanations, exposing flawed comparisons and pointing out unsubstantiated assertions. This includes an extensive section on Book of Mormon names that have supposed parallels in ancient inscriptions. Finley examines the linguistic evidence provided by Mormon apologists and then explains how they have misrepresented, misinterpreted and at times omitted information that does not support their assertions (pp. 353-359). It does not appear to me that the name Ammonihah (Alma 8:6-9,14,16) actually shows up on the Hebrew inscriptions listed by Tvedtnes, Gee and Roper. First, the ending –ihah is not he same as –iah. Tvedtnes thinks the form –ihah may be due to Joseph Smith’s “transliteration,” but forms with –iah also occur in the Book of Mormon (e.g., Sariah and Mosiah). It is difficult to understand why the Hebrew sound /ya/ would be represented by –ihah. Nibley ascribes the spelling to “a common metatheses” [sic], but why would such a metathesis occur in the divine name? Besides, even –hiah would not be like the names on the inscriptions (p. 356). Thus, a peer review of Mormon scholarly defenses often reveals them to be weak and unsubstantiated. Few areas of discussion generate the intense dialogue and potential personal offense among Mormon members as the question of whether or not the Mormon Church should be considered “Christian.” Part III of New Mormon Challenge contains two chapters designed to both shed light and dispel the heat from this discussion. The first chapter, by Dr. Paul Owen, looks at the issue of monotheism: first how the Old Testament provides the background for New Testament monotheism, and the objections LDS scholars raise to a strict OT monotheism; secondly, monotheism found in the New Testament context; and thirdly, the Trinitarian content of New Testament monotheism. Owen’s chapter also includes a section on the objections to Jewish monotheism raised by Peter Hayman and Margaret Barker, which are used by Mormon apologists to support their rejection of biblical monotheism. The chapter that follows, by New Testament scholar Craig L. Blomberg, addresses head-on the question of “Is Mormonism Christian?” Rather than muster the usual doctrinal comparisons (which are relevant), Blomberg takes a broader historical view and examines in detail the LDS claims to have provided the world with a completely restored Christianity. He looks at the issues of apostasy, the New Testament documents, whether or not Mormonism constitutes a “new form” of Christianity, and whether or not LDS theology is making some subtle shifts toward a more orthodox conception of God, sin, salvation and the universe. Can a Mormon, then, be a Christian in this narrower, more biblical sense of “being saved” or “converted”? Can such a genuinely converted person remain within the LDS Church? The answers he provides are insightful and thought-provoking. 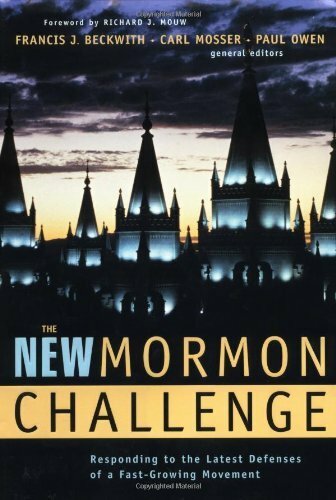 I received your suggested book, "The New Mormon Challenge" It appears to be very well written. I am diving in head first. I appreciate the non-confrontational, and respectful approach of the book. I never appreciated being told by non-Mormons what it was that I believed. The respectful tone of these essays, then, is a laudable attempt to set the record straight — not by coating over real disagreements, but by inviting our Mormon friends to engage in mutual exploration of some of the most fundamental issues that bear on the human condition. This invitation is based on the conviction, stated explicitly in these pages, that these essays are not meant to be the last word spoken on any of the subjects covered (pp. 11-12). New Mormon Challenge is well executed resource that will benefit anyone desiring an objective, engaging analysis and commentary on the foundational issues of Mormon theology in light of historic, biblical Christianity. As one who has spent over 18 years in apologetic ministry, much of which has involved sustained and respectful dialogue with Mormon people, I find this an unfortunate over-generalization on Mouw’s part. It overlooks significant work done by individuals and groups who for decades have gone out of their way to understand, thoroughly document and respectfully represent Mormon doctrine and history A few notable examples are the late Wesley P. Walters, a Presbyterian minister whose research was respected and encouraged by Mormon scholars and researchers, the North American Mission Board’s The Mormon Puzzle video which included extensive interviews with Mormon scholars and rank and file and sought to promote respect and understanding between Mormons and evangelical Christians, our own Mormons in Transition website which receives regular praise internationally from Mormons for attitude, tone and quality of research, and our 2002 release of the documentary film, The Lost Book of Abraham: Investigating a Remarkable Mormon Claim, which over 50% of active Mormons who viewed it characterized as “balanced and respectful” according to surveys following multiple screenings of the film in Provo and Salt Lake City.